It’s Remembrance Sunday in Commonwealth countries, first dedicated by George V in 1919. At first, the memorial was made to observe members of the armed forces killed in Word War I, but since then the occasion has swelled to commemorate more generally the sacrifices of fighters and civilians fallen in all conflicts. Officially Remembrance Day falls on 11 November, to recall the end of World War I on that date in 1918: major hostilities were formally ended “at the 11th hour of the 11th day of the 11th month” of 1918, with the signing of the Armistice. With people all over the world pulling together in minutes of silence at this time, I’ve picked a picture to inspire quiet and contemplation. 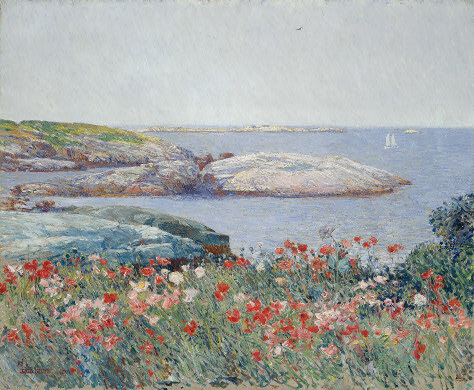 Poppies (1891) is by the American artist Childe Hassam (1859 – 1935) and squares off a scene somewhere around the Isles of Shoals, some small, rocked and treeless islands off the New Hampshire coast. Hassam had a poet friend called Celia Thaxter with a house on one of those islands, and between 1890 and 1894 he painted lots of pictures there. The composition sits settled and serene, split into three horizontal bands, each with distinct colours and cast of brush. In the foreground red and green grunge together in fatly focussed flowers and fine slashed stalks. The middle-ground is more mellow, all mauve, grey and white demarcating water and rocks. Finally the pale and wan sky sits still on top. The poppy is of course a familiar emblem of Remembrance Day: these were the flowers that bloomed in billowing masses across the worst battlefields in Flanders in the Great War, and their brilliant papery petals remind of blood spilled in fighting. But it’s the poem In Flanders Fields that forges most memorably the link between poppies and Remembrance. It’s perhaps one of the most notable poems written in World War I, purportedly by a Canadian physician Lieutenant Colonel Jon McCrae, after he witnessed the death of a friend the day before.